There are two different vessels utilized for this cruise. The outbound portion of this cruise is on M/V Challenger and inbound on M/V Thomas Laighton. Spend the day on Star Island. 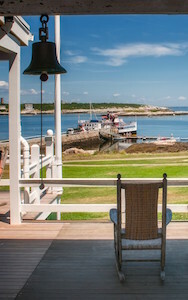 This cruise lets you experience our Isles of Shoals and Portsmouth harbor tour, the Star Island Walking tour and stay for the day on Star Island! You’ll spend approximately 4.5 hours exploring Star Island. Participation in the Walking Tour is optional.